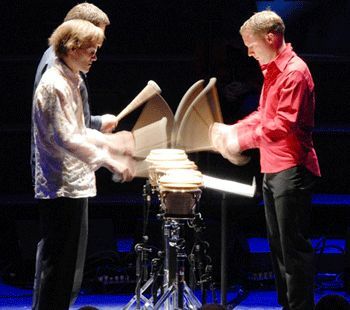 Steve Reich's Drumming works so well because, in line with Reich's famous goal of making audible in music – indeed making the one indistinguishable from the other –the 'gradual processes' that define his and others’ minimalist compositional techniques, it takes as its subject one of the most fundamental cognitive modes through which we hear and understand music. Thus, the matter of the composition arises principally from the gradual filling in of a fundamental thematic pattern which then interlocks with itself according to shifting cycles in seemingly endless ways, with new patterns also being introduced explicitly following their implication by the resultant sound-texture of the ensemble. This system of organisation plays directly and explicitly in to both the pattern-making habits of our brains, and to the psychoacoustic principle of the phantom effect, where information is cognitively supplied by the listener according to emergent sounds arising from the musicians’ collective performance. The piece, then, is about the horizontal and vertical development of a fundamental 12/8 pattern, a development that neatly and fluently marries minimalist compositional technique to basic models of human cognition. Drumming is written for a percussion ensemble of nine players, who each take up various roles as marimba, small tuned drum, and glockenspiel players, in addition to two female vocalists, one of who doubles as a whistler, and a piccolo player. Like Reich's preceding compositions Drumming makes extensive use of the composer’s patented technique of phasing, where two musicians (or more) playing identical patterns gradually move out of phase through acceleration in one of their parts, before syncing again, but now with their patterns interlocking in a different way. Unlike his work up until that point, however, Drumming uses distinct (though sympathetic) timbres: thus, the first section features the drums exclusively, before these give way (spellbindingly, here) to the marimbas (on which the whole nine players eventually play), which lead to glockenspiels, piccolo, and voices, before the piece culminates in a mixed ensemble that recalls each of the three preceding sections. Key in performing the work is maintenance of balance between order and caprice, though the latter, with the exception of indeterminate numbers of repeats, for example, is largely an illusion of the broad dynamic range available and the sheer mathematical complexity of the rhythmic heterophony. This balance has already been accomplished, of course, in the brilliant and incisive compositional scaffolding of the work itself, but it is nevertheless to the communication of this quality (which presumes accuracy of execution) that performers must dedicate themselves. Our performers this evening – the Colin Currie Group with Synergy Vocals – managed this balance with aplomb. With each phasing you felt wonderfully on edge, for example, confident in the musicians' skill but nevertheless wracked by a strangely dreadful tension. The accuracy of execution, meanwhile, with the exception of the odd dropped mallet and a little timidity in the singing (though, to clarify, the fault may have been primarily with the sound engineer as the vocals appeared buried in the mix from time-to-time), was absolutely top notch. (The singers generally showed good sensitivity to the pacing and weight of the ensemble.) The first section leant heavily on high dramatics, a level of intensity that, when carried forward to the reappearance of the drums in the final section threatened to overshadow the tone-colours and subtlety of pattern in the rest of the ensemble somewhat, but actually more generally set a boldly invigorating template for the rest of the performance. The third section, with its whistles, its high flute, and its metallophones, enchantingly recalled Javanese Gamelan, in sound if not quite in organisation, whilst the second sections' marimbas proved the highlight of the night for me, with the instruments' sea of overtones forming itself into a heaving ghost fixated on an almost-straight five note diatonic motif. A wonderful performance, then, whose only drawback was that considering the setting the propulsions of its sound could not be met by similarly animated and energized movement in its audience! Drumming will be performed in Bristol’s Colston Hall (May 11th), Reading Concert Hall (June 12th), and Cheltenham Festival (July 3rd).